The tune for "Ding Dong! Merrily on High" was originally a secular dance tune and appeared in print in the early 1500s. The lyrics, composed by George Ratcliffe Woodward, were first published in 1924. Woodward's interest in church bell ringing influenced the lyrics to this carol. Read more about the carol here. I love the imagery of the heavens being split apart with the singing of angels at the birth of Christ. Certainly that is cause to sing gloria! I can't carry a tune in a bucket, as the saying goes, but I enjoy listening to carols at Christmas and joining in on the glorias when I'm home alone and no one can hear me. I think the boys in this choir from Kings College Cambridge have beautiful voices. 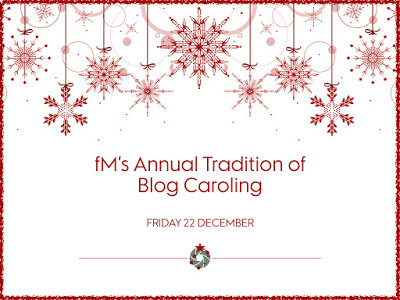 This post was written to participate in footnoteMaven's 2017 Annual Tradition of Blog Caroling. Go to her blog on or after December 22 to join in the caroling. Thank you for the invitation to join and for hosting such a fun activity, footnoteMaven. What is your favorite carol? Copyright © 2017, Nancy Messier. This is a completely new Christmas carol for me. I have never heard of it, but I love how lively it is and, of course, the church is gorgeous. Merry Christmas and Happy New Year! I don't know how I came across this carol, Linda, and I can't remember how long I've known about it. This year was the year it stuck in my mind and became this year's favorite. Merry Christmas to you, too! I love the video you chose for this carol. It's fun to see the organist playing and the church is beautiful. Thank you, Elise. I would love to visit the church in person, it's so unlike any church I've visited in the U.S. I always admire the organists who play for these boys. They always seem young themselves but so very talented.